EPICOX RED OXIDE PRIMER is a two pack polyamide cured epoxy coating which has excellent adhesion, impact,abrasion resistance and rust-preventive properties. High abrasion and mar resistance to splash , spillage and immersion in a wide range of chemicals. – Do not apply when the relative humidity exceeds 85% or when the surface to be coated is less than 3° above the dew point. – Do not apply at temperature below 7°C .If not , drying and overcoating times will be considerably extended. – During application of the paint, naked flame , welding operations and smoking should not be allowed and adequate ventilation should be provided. For maximum performance this product should be applied to a surface that has been cleaned and suitably primed. 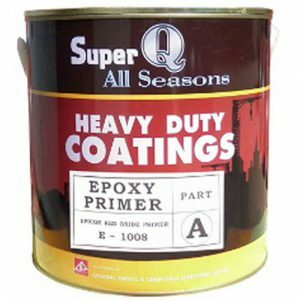 This coating is usually applied over a suitable primer, undercoat or build-up coat. This underlying system should be sound and undamaged. The surface to be overcoated must be dry and free from surface contaminants. All wax, oil and grease should be removed by solvent for cleaning. Soluble salts, dirt and dust must be removed prior to applying the coating. All equipment should be cleaned immediately with Super Q Thinner after use.